FERNDALE—Those who have spent time in Ferndale recently may have noticed several bright yellow, on-street bicycle racks that have been popping up around its downtown. These racks – six to date – are part of a joint project by the Ferndale Downtown Development Authority and the City of Ferndale to create a more walkable community that is easily accessible by non-motorists, with an additional five to be installed later this year. The Ferndale DDA has added more than 35 bicycle racks to downtown sidewalks in the past four years. But it wasn’t until May 2012 it installed its first on-street bike parking rack near the Western Market at 447 W. Nine Mile Road. It has since added five additional on-street racks, including another two on Nine Mile Road, one on Vester Road and one on Troy Road, as well as its most recent on Woodward Avenue in early July. 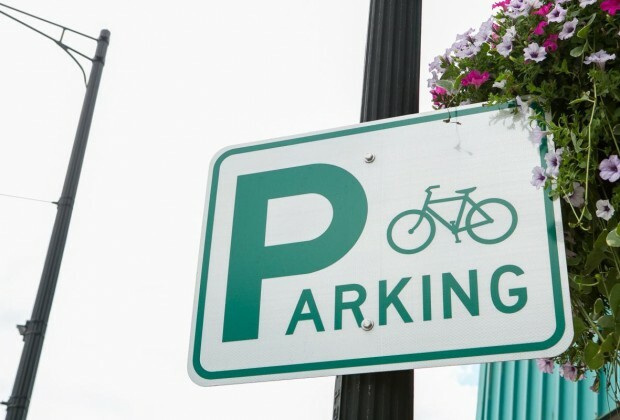 The installation was the first on-street bike rack to be placed on a Michigan trunk line, which the Michigan Department of Transportation said supports the state’s Complete Streets policy to make roads more accessible for both motorized and non-motorized transportation. 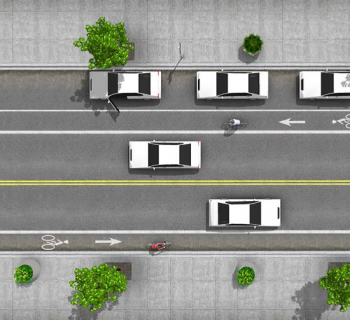 “This installation supports MDOT’s commitment to multi-modal transportation services and complements the legislators’ Complete Streets Policy by providing safe options for all users of the state trunk line system,” spokesperson Rob Morosi said in a press release. The on-street bike racks take up a former parking space and hold up to 12 bikes. Each one is painted bright yellow and Sheppard-Decius said the DDA has started streamlining the racks to make them as noticeable and protected as possible by adding bumpers, reflective tape, stanchions and thermoplastic tape that marks the designated bike parking area. Sheppard-Decius said the purchase and installation of each of the on-street racks costs about $1,000 and about $200 for sidewalk bike racks. She estimated the DDA and city have spent about $25,000 on the project so far over the past few years and the move is also an investment in the local economy. “The more people you can get into your downtown in different ways, the strong your economy is going to be,” she said. Several downtown restaurants and retailers said they were happy with changes. Michael Hennes, owner of the Howes Bayou restaurant at 22848 Woodward Avenue, said he had been pushing for more bicycle parking since his restaurant added patio seating and was happy when the bicycle rack was installed in front of his restaurant. 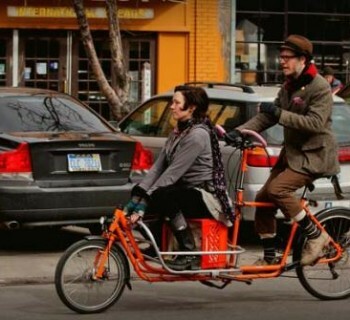 Hennes, himself an avid cyclist, said feedback from customers has been almost entirely positive. “Some people are confused by it initially, but they just haven’t seen one on a major road before,” he said. Kevin Rogers, owner of Just 4 Us café and gift shop on 211 W. 9 Mile has had a bike rack in front of his store for nearly a year. He said he has seen some problems of motorists backing into the bike racks, but overall is supportive of the project. “People are using them, a lot of local people in town, and it’s nice to see it happen that way,” he said. Down the road, Sheppard-Decius said they are considering adding additional on-street bike racks next year, they just have to wait and see.